Fijian Drua coach Senirusi Seruvakula says his players were guilty of overconfidence as they crashed to a first home defeat in the Australian National Rugby Championship. The Drua remain in third place after the 24-17 defeat to Queensland Country in Lautoka at the weekend, their second loss in three games. Senirusi Seruvakula said the crowd turned up in numbers and they had a lot of opportunities to win but made too many simple mistakes. "It was a very disappointing result that we [did] not expect it," he said. "The boys just played overconfident - there were a lot of indisciplined errors and 50/50 passes and that showed in the result. "At the same time Queensland Country were prepared on the gameday." "The game was ours - there was a lot of opportunities, there were a lot of opportunities - and the Country cannot keep up with the pace that we were playing," reflected Seruvakula. "But just the last pass and there were a lot of 50/50 passes and forward passes when the score was not given." The Drua can still seal a semifinal berth, in their inaugural season, with victory over the Sydney Rays, who defied their lowly eighth placing to stun the Perth Spirit 44-31 on the road at the weekend. in Suva on Saturday. Senirusi Seruvakula said there will be no chance of the home team taking their opponents lightly. "We'll be doing a lot of team meetings and also one on one meetings and then this week we will be doing a lot of clarity, so they understand what's expected of them in all zones on the field," he said. 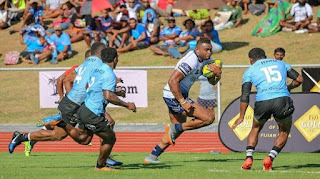 "Also we're going to test a lot of new players, who are going to be playing in the run-on (team) because we are losing six players who are going to the Northern Tour this week for the Flying Fijians. "As a coach I have to have faith in my players and I have full confidence that these guys, given the opportunity, that they will rise up to the occasion." Photo: QRU Media/Australian Rugby Former Fiji rugby league international Eto Nabuli scored a try against the Drua on his return home.